The Members Church of God International (MCGI) launches a people’s day celebration called Feast Dedicated to God (Fiesta ng Dios) on Sunday, February 24, 2019, wherein guests and Church members will be treated to a free sumptuous lunch as well as other fun activities. Through this event, the Church aims to share an enjoyable celebration — and the love of the Lord — to all. The event’s main venue is at the ADD Convention Center in Apalit, Pampanga, in the Philippines and in select coordinating centers all over the country and in different parts of the world. The Feast of God event is slated to begin at 10 a.m. PHT. Celebrate the "Fiesta ng Dios" with the Members Church of God International!February 24, 2019 (Sunday), 10 a.m. PHTADD Convention Center, Apalit, PampangaAnd selected ADD Coordinating CentersCreate memories with our games, performances and delectable meals! Everyone is invited! See you all, God willing! Fun activities and delectable meals await everyone who will attend the “Fiesta ng Dios” on February 24, 2019. The special celebration was announced by Bro. Eli Soriano, Overall Servant of MCGI, on February 16, 2019, at a weekly celebration of Thanksgiving of God’s People. He emphasized that this will be a feast dedicated to no other being except the Lord God Almighty. “We will hold this feast according to what the Bible says — we will invite the poor, the blind, and the disabled,” shared Bro. Soriano to the congregation. In true MCGI fashion, the people’s day celebration of the Church will provide guests with sumptuous meals and refreshments, games, as well as musical entertainment. In this special occasion, everyone, especially the less fortunate will enjoy delectable meals that are specially prepared for them. 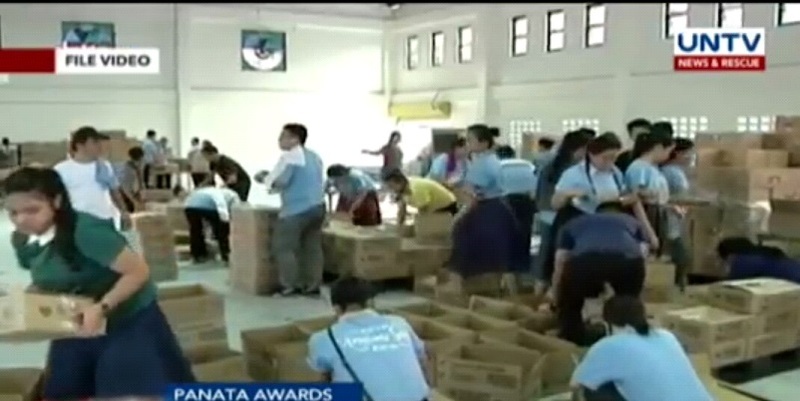 The Members Church of God International (MCGI) recently received a special recognition from the Department of Social Welfare and Development (DSWD), citing the religious organization’s unwavering volunteerism during the agency’s relief operations for Supertyphoon Yolanda and Marawi Conflict, among others. DSWD organized the 2018 Pagkilala sa Natatanging Kontribusyon sa Bayan (PaNata Ko sa Bayan) held at the DSWD Central Office Auditorium on March 8 this year. MCGI helper of the ministry Bro. 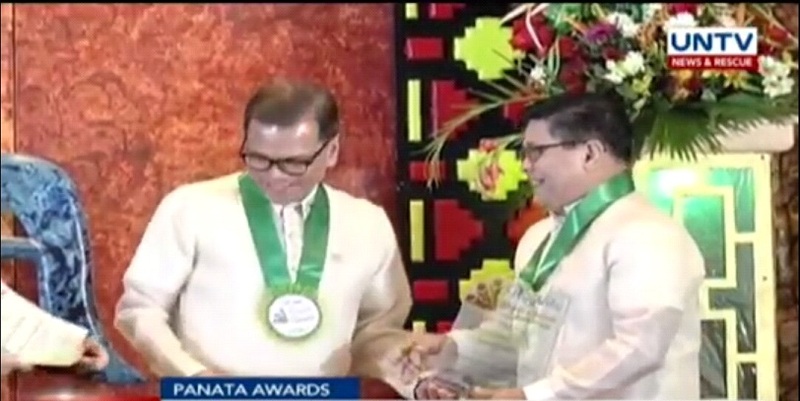 Danny Navalez received the “Salamat Po Award” from DSWD, on behalf of MCGI. In the onslaught of Supertyphoon Yolanda and storm Vinta in Mindanao, in the five-month-long armed conflict in the city of Marawi, and during the restiveness of Mayon Volcano, MCGI consistently worked with DSWD in giving assistance to the victims. MCGI volunteers helped in the repacking of relief goods in the warehouse of DSWD. Meanwhile, DSWD Under Secretary Luzviminda Ilagan expressed her earnest appreciation to MCGI for its unceasing support in the agency’s disaster response efforts. MCGI volunteers help repack relief goods in the DSWD warehouse. “I would like to express my heartfelt gratitude and congratulations to MCGI for having partnered with DSWD. Their work has really been of great help to us especially during the times of calamities when we need more hands in order to deliver the goods”. DSWD annually gives recognition to its partners and stakeholders who have been supportive of their mission to providing assistance to the poor through this event. It hold itself responsible for the protection of the rights and welfare of the poor, vulnerable and disadvantaged Filipinos. MCGI is known for its humanitarian services, such as medical mission, legal services, and caregiving services through ADD Foundation. Also, MCGI is a consistent Jose Rizal Awardee of Philippine Blood Society, the highest recognition in the field of blood donation in the Philippines. Manila, Philippines (2 May 2016) – More than 3,000 youth members throughout Metro Manila took advantage of the summer break and participated in the annual Metro Manila Youth Sports Activity (MMYSA). 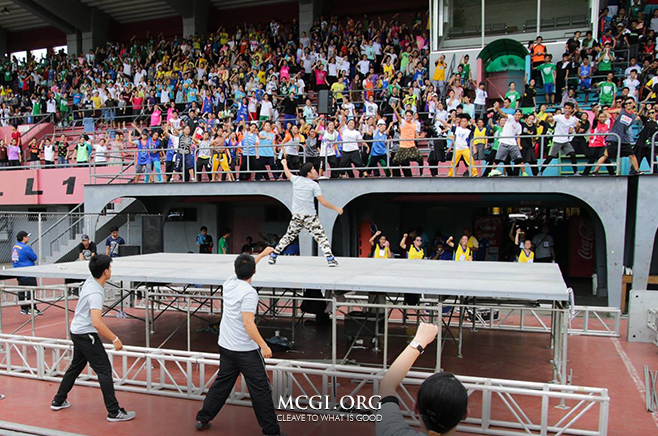 The event was organized by the Youth Ministry of the Members Church of God International (MCGI) on May 2, 2016 at the Marikina Sports Complex. The event aims to promote camaraderie, synergy, good health and fitness via physical activities — a campaign that MCGI Overall Servants Bro. Eli Soriano and Bro. Daniel Razon constantly call for, as it is written in 3 John 1:2. Bro. Christian Anthony Santiago, National Capital Region Youth Ministry Coordinator and MMYSA Organizer, said the event is constantly changing for the better, as it strives to better serve the MCGI youth members in the area. “The program, throughout the years, has seen a lot of improvements, innovations, and creativity of the Youth Ministry, with the help of the Division Teatro Kristiano and Music Ministry,” remarked Bro. Christian. The event proper started with MCGI’s congregational singing and an opening prayer. Shortly after, it was followed by Zumba, a popular dance fitness program which served as the participants’ warm-up exercise, and the five districts’ parade of colors. Despite the scorching summer heat, everyone was in high spirits and competed for the following games: basketball, badminton, table tennis, volleyball, track and field, dodgeball, sackrace, patintero, tug of war, chess, scrabble, games of the general, Pinoy Basketball, Pinoy Gladiator, and the crowd’s favorite cheerdance competition. Bro. Mark Johnbill Aga, 22 years old from Quezon City, shared how memorable his appreciation of this year’s MMYSA, especially the cheerdance competition. “I hope we can have cheerdance again next year because we love cheering for our district thru the form of dancing. It is also a way of inviting our fellow youth to be [more] active in the Youth Ministry,” said Bro. Mark. The MMYSA started on February 15, 2009, and was previously called the Metro manila Sports Activity. Successive Youth Conventions of the Church’s different divisions are being done all throughout the summer season. Read short testimonials of faith from some of MCGI’s youngest brethren baptized on October 17, 2014 at the ADD Convention Center in Apalit, Pampanga. This is the true religion spoken of the Bible. After I graduated, I immediately underwent indoctrination. I feel light. It’s like you’re flying. I hope that they will spread the Word of God more, and may they better keep their bodily strength that God gives us. This is where I found the truth, and what he [Bro. Eliseo Soriano] says about the Bible is true. Also, all of the righteousness he teaches come from the Bible, not from his own intentions nor from his own principles. All are based in the Bible, as the prophets of old have done. I always watch [The Old Path] on TV. My father is also a member, as well as my eldest daughter; she was the one who told me, “Papa, listen for you to know the true religion.” So I listened nightly since 2013 until now. I studied the verses because I understand the Bible as I watch [Bro. Eli]. As he explains, the verses and everything he says comes to my mind. Everything he says is true; he doesn’t say anything that doesn’t come from the Bible. He doesn’t reason out from his own, but from the Bible. That’s what I like about him. I felt as if a bird that got free from its cage. I felt like a thorn from my heart has been pulled out. I also felt as if I were walking, floating over clouds. I felt so blessed; I can’t explain it. It feels light inside, like I’m a new man. I hope his life will be longer and that he’ll be able to help more people. I wanted to know the doctrines [my parents] follow. I learned a lot of good teachings, because of that I feel light. I’m happy; I feel light. May they continue, that they may be able to help many more people. This is the true Church. It’s unlike Catholicism wherein they hide the Word of God. That’s what I realized the first day I listened to the indoctrination sessions, that this [Church of the] true God is better. Even on just the second day [of the indoctrination sessions], I already learned something; it really pierced my heart. “This is perhaps the true religion that I must join,” I told myself then. So I continued until I completed the indoctrination. Ever since then, every time I would go home [from indoctrination], my wife would be bewildered by how kind I was. I said, “This is what The Old Path does to me: To change, to be humble.” Everything changed in me since I knew The Old Path, the Church of God. It felt really light, like so many problems and evil spirits were gone from my body. My message to Bro. Eli is, may he be able to continue this until he spreads the Word of God in the whole world. And to Bro. Daniel, the same as well. May they both take care of their health. I heard the truth. Also, in my previous religion there really is no true doctrine; this is only where I found the truth through the instrumentality and teaching of Bro. Eli. My older sister was baptized first; then my parents followed. I learned about [the Church of God] through my parents. When Papa learned that my older sister became a member, he got curious as to why she did so, because they didn’t know about it. So they tried and watched on [Channel 37]. In the wee hours of the morning, he listens. That’s when we say that it’s right, and Papa got baptized as well. I feel so new. It feels light inside, and the old burdens are no more. To Bro. Eli and Bro. Daniel, many, many thanks. Because of you, we learned the truth. Thanks be to God for giving you as instruments to teach the truth. That’s all and many, many thanks. This is where I proved the true Church. I’ve been listening for five years, as my parents are already members. But since I see that the end is nearing and nearing, I thought to myself that I really need to serve God already while I am still young. That should the end come, I will be with Him in heaven, God willing. Many thanks to God for giving me a chance to serve Him, and thank Him with my whole heart. So I grabbed this opportunity to serve Him. Before, I got hindered by things like women’s apparel. But I now understand that women should really wear modest apparel. It’s like I saw a light, and I can’t explain what I feel. I really can’t explain the joy I feel. Thanks be to God for my parents that they lead me here. I found the true Church, and I hope that I will be one of those who will be in heaven. Thanks be to God. To Bro. Eli and Bro. Daniel, may they continue propagating about the Church that many more souls like these will be saved with God’s mercy. It’s our duty to investigate what is being taught to us by our previous religion, and what kind of religion we are joining. I was still in high school or college then [when I heard The Old Path], but I didn’t take it seriously. There were also many struggles that happened in my life before I graduated. I had many ups-and-downs; I had a few ups, but mostly, downs. Then, during the time Typhoon Glenda struck, there were mind-boggling circumstances that happened. It wasn’t [normal] anymore. [I thought] what should you do to change, to be able to encourage others as well to do the same, to find the truth and know what you must do with your life? I hope this feeling stays, not only for me, but for others to be moved as well and know the truth. I hope that they live longer here [on earth], that while they live, they may be able to lead many more. To those who still feel hesitation, may they be enlightened by Bro. Eli and Bro. Daniel. Through the program on television, I started listening on UNTV every 10 o’ clock. Sometimes, I started at 9 pm. But sometimes I wouldn’t be able to finish it as I would be so exhausted from work. I loved listening to the question-and-answer portion after work. I’ve been listening to [Bro. Eliseo Soriano] on television for five years now. Also on radio. I also learned about [The Old Path] through your banners in different places. Actually, I really don’t like watching TV. I just watch news, but teleseryes (soaps), I’m not really fond of. I don’t have much interest in such as I like watching shows from where I can learn something, something that would help me in my life. When I lost cable, I got it reconnected because I want to see a clear signal of UNTV. So I can listen to the Word, as I feel different when watching; I feel that I’m happy and enlightened. There’s a great difference than when I was a Catholic, because there, they don’t really teach who the Lord is. I just knew that God was a statue, and when I go to church, it’s mostly whenever I just feel like it. The truth is, whenever I have new clothes, it’s like I just go to Church to have them blessed. But when I [heard] the doctrines, I felt something different that I couldn’t explain. Even when I wasn’t yet being immersed, I already felt the Lord’s presence. I don’t know, but I just felt so happy that I cried. I couldn’t express the happiness, the joy I felt. Then, the heaviness [melted away]. When I got immersed in the water, I was still crying. I thank God that I felt the Lord’s forgiveness. After I emerged from the water, a brother assisted me; a little later on, I was given a small paper, and was told that it was my birthday. I am sure that I didn’t make a wrong move joining the faith I am now in. I acknowledge that that was the Lord [with me in baptism], that I wasn’t wrong in my decision. I hope their lives will be longer. May the Lord give them many more years. May they not tire in continuing to share the good words of the Lord. I also hope that they’ll be able to help many more people, that many more will be led to salvation before the Lord returns. May God bless them. I joined because I want to increase my knowledge and lessen my sins. A friend brought me to the indoctrination sessions. It was the first time I heard [Bro. Eliseo Soriano]. In my previous religion, Roman Catholic, I didn’t know much what is right or what is wrong. It’s because they don’t teach whether one thing is right or not. They just want to worship and offer things, etc. I felt light, and my sins have been [forgiven], because when you get baptized your whole being is cleansed. Bro. Eli, I hope that your life be lengthened, and be given better [health]. Bro. Daniel, please don’t tire in helping people, people who still don’t know what having God in their lives means. Read short testimonials of faith from some of MCGI’s youngest brethren baptized on May 16, 2014 at the ADD Convention Center in Apalit, Pampanga. It feels good, like my body has been cleansed. My experience made me feel at ease. The first time that I heard [Bro. Eli Soriano], I was really okay with what he was saying. I was really listening, but it took a while for me to watch him again as I wasn’t really paying much attention to him before. After some time I listened again, but it wasn’t really continuous because I was a Catholic then. One day, I went to a coordinating center. It was because of my teacher. She was a member and she invited me there. The first time she invited me was during a Bible Study. I didn’t attend the indoctrination just yet. About a year passed before I was able to attend again. Then I attended the Mass Indoctrination, since then it was continuous. My message to Bro. Eli, he is so kind, awesome. Everything he says is in the Bible; everything is of the truth and not mere fiction. To Bro. Daniel, he is also very awesome like Bro. Eli. May you continue to be instruments of the Lord for the greater good and for more people to know the true teachings of God. I feel like all that sins I was thinking about before, I feel like I am at ease now like my sins were forgiven by God. I am happy because I entered the Church; I am now truly a member. When I was still a child, my parents were already members. When I was still in high school, they invited me [to attend]. I was with bad company at that time; I was really stubborn. I wasn’t listening to my parents. Before, I didn’t really want to go with them to Church gatherings. It’s not like they were forcing me, but I attended even though I didn’t really want to. But when I got to listen to what Bro. Eli was teaching, I was moved. I was invited to Bible Expositions, to worship services and prayer meetings in the coordinating centers. I am very thankful. Thank you so much for being the ones who taught me God’s teachings. They have genuine concern towards fellowmen so they teach the true Gospel. I’m happy; I feel at ease. I lost all those burdening feelings. My heart was enlightened, so I decided to be a member. My aunts are already members. But I wasn’t ready back then, so I didn’t go with them. Before, they would always invite me, when I went home to Angeles, then it stopped. Then here at home my uncle was a member and he would invite me. So I accepted it and I listened to the teachings. [The teachings] are nice to hear. They make me feel at ease. The anger inside me also vanished. It all disappeared. I thank them for guiding me through their preachings. I hope that they can guide the whole congregation for a long time. I feel light. I even have clearer vision, even when my eyes are closed. Everything is so clear. I’m very happy. When I was walking [in the pool], it’s like I can’t feel the ground, like I was floating. That was what I was really feeling. My family, my parents, my sisters are members; I followed them. I was able to listen before when I was nine years old. They didn’t force me to be a member; they waited for me to be ready and have the initiative. I understood the doctrine better even when I was listening before, even when I was younger. Now it’s clearer. I thank both of them, and I hope they don’t get tired of teaching and spreading the word of God. When I was immersed in water, it was like I choked when I emerged. [The ill feeling I had] was suddenly gone; I was breathing comfortably. Then I felt so light. I was able to set aside my problems and focus on thanking the Lord Jesus Christ. Actually when I was a kid, I accidentally changed the channel to Bro. Eli’s. I was curious about [The Old Path] when I was a kid. I got to listen to him again when Sis. Lea brought me to the coordinating center. It was just this year, when I attended the worship service. The teaching was really clear and accurate. I easily grasped it. All the things that were forbidden were explained really well, and everything was based on the Bible. It was good. I hope they will be given longer lives, so they can continue preaching the teachings of God and lead more souls like us. Take a glimpse at the activities and festivities at the three-day International Thanksgiving of the members of the Church of God. Members Church of God International or MCGI with UNTV conducted a series of relief operations in barangays in Quezon City, Philippines on August 21, 2013 to displaced families in wake of floods caused by Typhoon Maring. 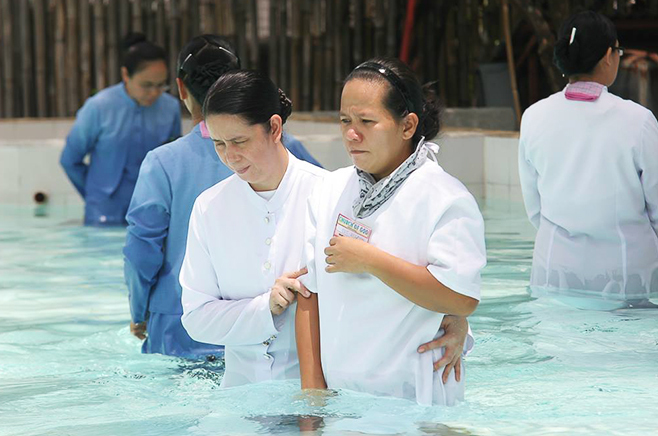 Read short testimonies of faith from some of MCGI’s youngest brethren baptized on May 24, 2013. It feels light inside. It just really feels good. It’s good and it’s light. The doubts in my heart were gone. It’s really a big change. I was actually resting as I watched UNTV when I heard someone ask about eating blood in the Bible Exposition. That’s when I knew that what Bro. Eli says is right. Bro. Eli, I hope you’ll have more life in preaching the Word of God because it’s a great thing to save many souls from damnation. I hope his life extends and also that of Bro. Daniel’s. I hope that the preaching of God’s words will spread to the whole world. I hope his life extends and also that of Bro. Daniel’s. I hope that the preaching of God’s words will spread to the whole world. First of all, it’s a really good feeling. It’s overwhelming and it feels like the heaviness in my heart is gone. My former life that had burdens and anger in my heart, [including the] hassles in my mind, it’s as if all those disappeared. I feel that my life now has assurance that God will shed light in the path that I will tread. Whatever trials will come in this life, I hope they will overcome. May they have more strength and good health, and life that they may be able to spread more about God. My husband got baptized in the year 2000 [and] he’s 13 years in the Church now. He often brought me and my children here. That time, I couldn’t leave the children alone in the house as they were too young and need to be constantly looked after. But since now that they’re grown-up, I told my husband that I’m decided to be indoctrinated. I feel happy, as if a load has been lifted from me. Bro. Eli, I hope you’ll have to live a long life so you’ll be able to spread the words of God and preach the truth more to people like us who have turned back to Him. My heart feels unburdened. As Bro. Eli said, when you get baptized, it’s like you’re born again, like you’re a baby again. My father was already a member since 2010. I would watch [the program] till 3 in the morning, like my father does. The first time I heard it, I already learned a lot that I didn’t learn from Catholicism. I didn’t know that worshipping idols was prohibited. Bro. Eli’s reasoning was right. Why are you going to worship stone or wood when they wouldn’t know it? Besides, we don’t really even know what the Lord looks like. May the Lord God will for Bro. Eli to live a long life that he may be able to help many more, to lead many more to join the true Church of God. The same with Bro. Daniel. I got to listen to Bro. Eli Soriano’s Bible Exposition program this year on television. Then, I was invited by my cousin who is already a member here to attend the indoctrination sessions. Now, I feel light inside and I learned more about God. I hope that he continues to indoctrinate people, and I wish him more strength so that he may lead more people. I attended Bible Expositions and Bible Studies since last year. I also watch on television. Then, I attended indoctrination at the Locale of Sibunin. I feel good now. I hope that they will have a long life so that many more people will become members [of the Church] and be brought to God. I’ve been listening to Bro. Eli for a long time, for about ten years now. I’ve heard almost all questions. I’ve understood almost all that’s why I decided to be baptized because I may be too late someday. Before, my wife disagreed with me but God willed for us to be together here. She told me to say that she’s with me and that we have no further to disagree upon. With God’s mercy, I’ve finally been baptized and I’m very thankful. It’s as if my dream long ago to be a member had finally come true. Out of all preachers, they are only the ones I have proven that can answer anything you can ask about the Bible. I’m amazed by them. I feel light and happy. I really asked from God for the forgiveness of my sins, and it has been granted now. I’m happy that my sins have been fully forgiven, and that I’m ready to change. Now that I’ve been baptized, I’m ready to obey the laws in the Church. For Bro. Eli and Bro. Daniel, thank you very, very much. If it weren’t for your Bible Exposition, for Ask Bro. Soriano, I wouldn’t be baptized; I wouldn’t reach this place. My son is already a member here. He got baptized in Dubai. He said to me that I should try and listen. When I did, I found that Bro. Eli’s doctrines were good, that it is really the truth. I’ve been to many religions before. I’ve been a Catholic, an Independent Catholic, and yet I didn’t hear what I learned from Bro. Eli in the indoctrination sessions. I feel happy and I feel I’ve achieved my life’s fulfillment. For Bro. Eli, may the Lord give him long life to live and health that he may preach the truth to many more people, the same with Bro. Daniel. I also hope that I can help bring what I heard to my grandchildren, to my family, and to the people of Isabela. I’ve been listening to Bro. Eli since the year 2000. The program [Ang Dating Daan] was still on SBN 21 back then. In 2000, I already underwent indoctrination, but it is only now that I went on with the baptism. I feel relieved inside. May God give them more strength and health that they may continue preaching the words of God to the whole world.